Miniature painting, or limning as it was traditionally called, developed from the art of illustrating sacred books, also called limning. 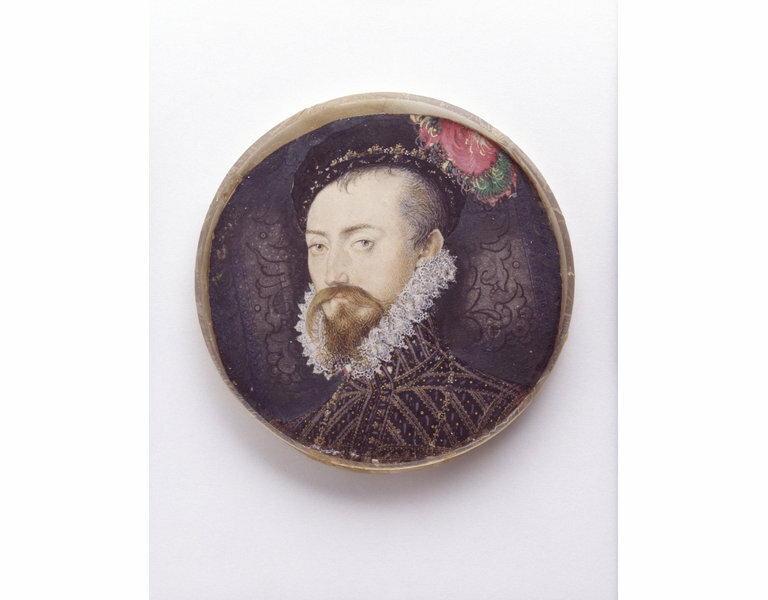 Nicholas Hilliard first trained as a goldsmith and in his early days as a limner was experimental in his approach to the art. In this miniature he kept the traditional round format, but in place of the conventional blue background painted a decorative pattern on a silver ground, which has now tarnished. Robert Dudley was the fifth son of the Duke of Northumberland. He rose rapidly to favour under Elizabeth I who made him Master of the Horse in 1558 and a privy councillor in 1559. He long hoped to marry the Queen, but the death of his wife in suspicious circumstances made this politically unwise. 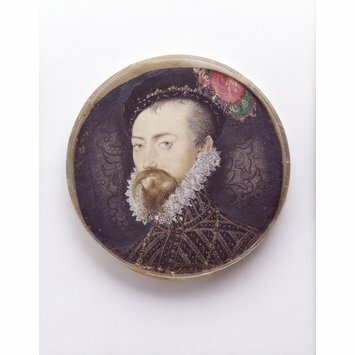 Dudley however remained a favourite, and in 1564 Elizabeth created him Earl of Leicester. Leicester was a notable patron of the arts and letters. In 1571, the year of his first known work as a limner, Hilliard prepared a 'booke of portraitures' for Leicester. In 1572 he painted the Queen for the first time, and it is likely that he got this commission through the influence of Leicester. Hilliard's gratitude to Leicester was such that he named his children after Leicester or those close to him. Watercolour on vellum depicting Robert Dudley, Earl of Leicester, wearing a black doublet embellished with gold, a thin gold chain suspended around his neck, from which would have hung the Lesser George of the Order of the Garter. He is also wearing a black cap, studded with gold jewels, and trimmed with red and green plumes. The background is painted as a silver damask curtain. 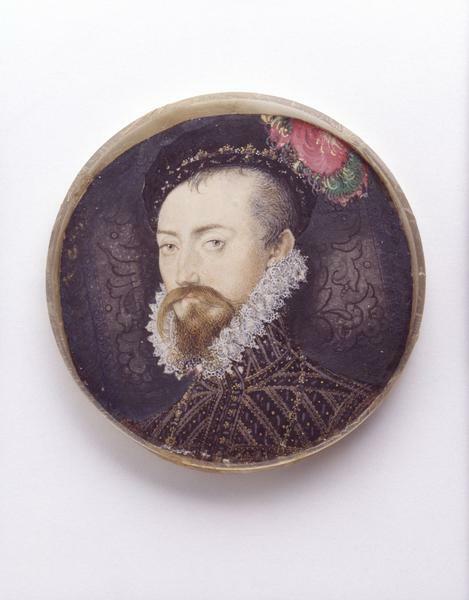 Portrait miniature on vellum by Nicholas Hilliard depicting Robert Dudley, Earl of Leicester. Great Britain, ca. 1571-74. The following in an excerpt from a valuation report made by Christie's of the estate of the late Rt. Hon. Viscount Harcourt, K. C. M. G., O. B. E.
"This is one of the most brilliant and outstanding of Hilliard's earliest miniatures, showing exquisitely painted features, painted in a bold and direct manner. The spontaneity suggests that this miniature was advivum. It demonstrates good preservation of delicate colours in the face which is very rare in the work of the artist, and it is a unique example of Hilliard employing a silver background. There are two other portraits of the sitter by Hilliard, one in the NPG, which dates from 1576, and the other in the private collection of Mrs E. Hamilton dating 1575. This miniature is the finest of them all and the earliest in date. The sitter is younger than in the other known portraits and can be pinpointed to a period between 1571-4 at a time when Hilliard was still experimenting with shape, size and format. After 1570 Hilliard was no longer a paid officer of the Court, therefore this must be one of the earliest examples of a known private patron, and is evidence of the Earl's wealth, power and position of patronage at this date."